On one of the same platforms where Nintendo courts grandma gamers comes yet another quietly-released title infused with a hipster passion for old-school video game culture. Pictobits is the fifth release of Nintendo's Art Style series. The aplty-named artsy series is a surprise, one that Nintendo's outreach to mainstream gamers-to-be never acknowledges. Spawned from a 2006 series of throwback art-object Game Boy Advance games developed mostly by Skip Ltd, Art Style games are made to play well but look stylishly primitive. They're the kinds of games that might be made by people who paint 8-bit Mario scenes for art galleries or knit Space Invaders scarves. Pictobits is a downloadable block-dropping puzzle released through DSiWare and playable solely with the stylus. The player must drag and drop colored blocks into position so that those falling above it form a matching cluster of at least four blocks. As is common in these games, combos win the player more points. The old-school-style twist is that each of the cleared colored blocks launches up to the DS' top-screen to paint pixelated characters and scenes literally from classic American and Japanese NES games. Finishing the pixel image means beating the game. But does all that style have substance or does it just disguise a genre retread? All This Old-School Affection - We've all played games in which scores are the measure of success. And we've played games that provide concept art as rewards. But it is a brand new joy to have a beloved scene from the Legend of Zelda or the sprites of Luigi and a Koopa recreated pixel by pixel as you take each step to success. And to fail out of a level because blocks have filled the screen before enough of the gray ones were launched to finish "drawing" the tire of an Excitebike bike? Well, that's not a bad way to fail. Drop and Draw - The game is challenging and depends on yet another re-wiring of one's brain. The ability to drop a single colored block or draw a bunch of them from a holster of blocks is novel. And it guarantees that few strategies learned from block-droppers like Tetris or Planet Puzzle League are applicable here. 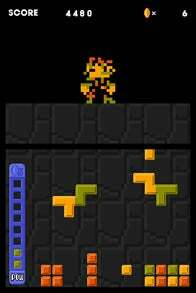 Lots To Play - Pictobits contains at least 30 levels of block-dropping, pixel-art-creating challenge, all-scored with re-mixes of classic 8-bit tunes. They last. The time it takes to earn enough in-game coins to unlock the game's 15 "dark" stages has exceeded the two weeks I've spent playing this game during many of my subway commutes. The Credits - Seriously. Finish the game's 15th core level and go to the credits. You'll hear a lovely medley of some of Nintendo's best 8-bit tunes, almost worth the price of the game itself. It Ends - I'm straining for negatives in a game that begs to have a sequel built for 16-bit art. Events like last summer's Nintendo E3 press conference paint the Kyoto giant as a company losing interest in dwelling on its past and maybe even embarrassed of the nerdiness of some of its colorful nostalgia acts. It is easy to see Nintendo as an enterprise running a brand not fully compatible with the old-school style so many cooler-than-thou adults who grew up in the 8-bit era are giddy about. But a release like Pictobits proves that Nintendo has multiple facets. It proves that whoever at Nintendo keeps letting the likes of Pictobits-maker Skip develop artsy throw-back video games still has a lot of love for what got this whole Nintendo thing rolling forward in the first place. Pictobits was developed by Skip Ltd for the Nintendo DSi and is available only through DSiWare download. Retails for 500 Nintendo points, or $5 USD. Played the game's main levels to completion and unlocked nine bonus levels.